I grew up in a rural area. Rural enough that dogs chased cars. Extraordinarily enough, the dogs never caught the cars. In fact, they never got close. It was good sport. 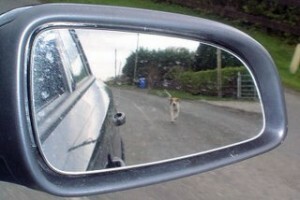 The dog felt very fulfilled, barked aggressively and made sure to never come close to catching the car. As best as I can recall, the car was never affected by the ordeal. How many of us catch the whiff of opportunity, chase after a new opportunity without stopping to consider the ramifications if we get it? I know I’ve cursed my luck for not getting a position, and jealously watch someone else get sucked down a drain. The ironic thing is how often the first person to win a great opportunity flame out. Either because the lacked the skills or because expectations got so carried away, no one could hope to succeed. That’s the dog who caught the car. So the next time you see that great opportunity and begin bargining your life away, think about whether it’s worth the tradeoffs necessary. Think about whether you have the skills and abilities to make the choice pay off. Think about whether you want to be the dog that catches the car. Strange how people in general can be blinded to the downsides or the upsides depending on the incentives involved for themselves. A person can go from a known optimist to a scathing pessimist in a wink if they have reason for it. I had a dog named Bentley (sic) who loved chasing cars. If it becomes a serious haibt in traffic, it’s over for the dog. But Bentley would chase them to the stop sign, then pee on the tire. Leave your mark PMs and feel vindicated for all the rest of the stuff you face. Bentley loved buses even better. Bigger tires. At my last position, one of my subordinates arrived to work in tears. Her dog, a car chaser, got his wish when he latched onto the front of a tire of a moving car. (Turn away now) It squashed his head like a grape. I guess I suffered the same fate. While I was there, I never turned down a project. I figured it was merely a part of the job to be challenged exponentially. With every success came more challenges. There came a time when my superiors may have felt threatened by me and presented me with an no-win project. I called this project the Kobayashi Maru. Needless to say, I don’t work there anymore. I bit the tire. I bit it hard.